Prior to YouTube, the majority of video marketing was done through ads and commercials run on live TV or through individual websites. In 2005, YouTube opened up new doors in the storytelling arena by offering a consolidated platform in which brands and individuals could post video content. YouTube quickly became the world's largest video sharing platform. This changed the video marketing scene. In addition to growing the accessibility of the video and lowering the cost, YouTube changed how content creators viewed brand videos. Brands could now have their own channels. They no longer were ads and videos interrupting other content, brand videos became the content. This shift also marked a shift in strategy for videos to become more engaging and tell a story, rather than push a product. When brand videos became content, the focus changed to look at brand story. The brands that are most successful are the ones who post content that is framed around a brand narrative rather than telling an explicit brand story. Videos are the perfect storytelling vehicle because of the combination of images, narrative, and audio that come together to form an emotional connection with an audience. As video marketing has developed, we have moved farther and farther away from product centered videos and move further into the storytelling arena. The most engaging videos, and the ones that get the most views, are the ones that share with the audience something they want to know. Read on to learn about how YouTube opened doors to telling engaging brand narratives through video and the best ways to share those stories through other social media sites. The content produced on YouTube should either be entertaining or practical. Creators should avoid making a video that sounds like an extended commercial. If a video is about a product, it should be answering a common question or explaining something new. How-to videos created by a product producer are a good way to integrate your product into your videos. This also develops your brand persona as being helpful and concerned about your consumers and the ease at which they can use your product. The videos that are made for entertainment purposes are your brand films. The product or brand itself is not the main focus of these videos, just a feature if they are in it at all. In terms of brand storytelling these are the kinds of videos that really develop your brand narrative. Brand films share a brand narrative in an indirect way by demonstrating it rather than telling it. Part of transmedia storytelling is sharing different sides of your brand in a way that backs up a common overarching narrative. Lyft uses their videos to demonstrate different sides of their brand persona, all while supporting their overarching brand narrative. Two examples of very different videos that share a common theme are their documentary series “Undercover Lyft” and their animated short “Life Is Better When You Share the Ride”. Both of these videos are successful with their viewers. The Chance the Rapper episode of “Undercover Lyft" gained 2.1M views and the “Life is Better When You Share the Ride” video got 7.7M views. 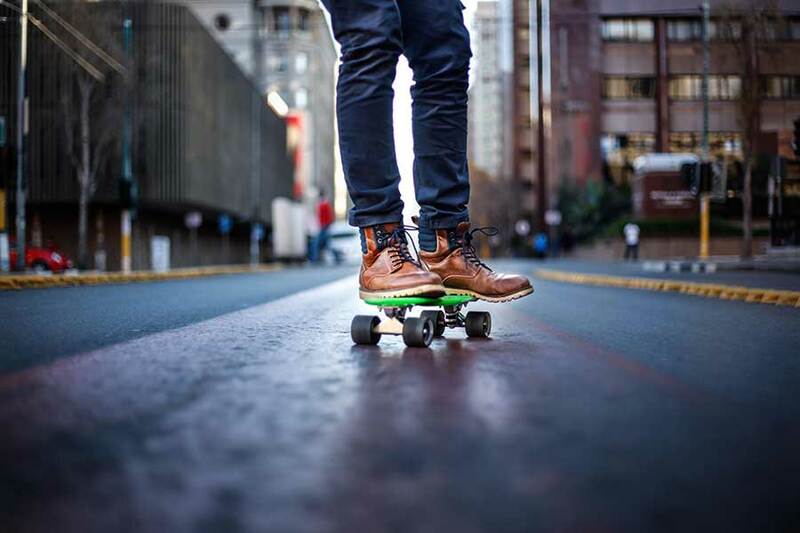 The videos are very different, from their videography style, to the topic, to the narrative style, yet the creators frame them around the same brand narrative. The common theme these two videos share is that both are about how drivers and passengers connect to create a ride sharing community. It supports the narrative that Lyft does more than just get you from point A to point B, Lyft fosters a community. Additionally, looking at brand persona, the differences in the videos demonstrate two different sides of the Lyft brand persona, one being young and fun and the other being caring and thoughtful. These two personas are not mutually exclusive, and one does not contradict the other. Because of this, when you watch both the videos you have a better understanding of who Lyft is as a character. Showing the two sides makes Lyft feel more 3 dimensional and human. The key to making successful YouTube video for your brand is showing what your audience wants to see and not being too direct with your brand story. These stories demonstrate a brand narrative but not in an explicit way. YouTube is still the leading place that viewers watch videos, but it’s not the only one. While YouTube has grown as a video platform, other social media sites have also developed. 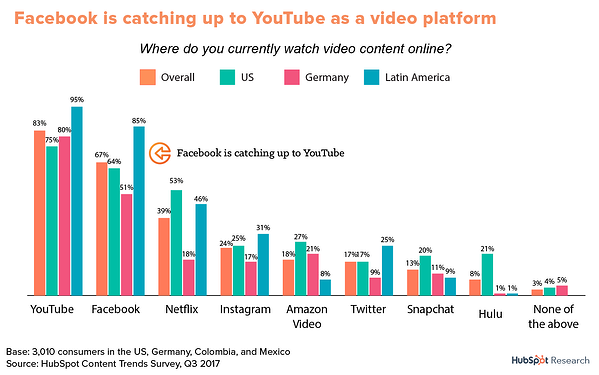 As this HubSpot graph demonstrates, social medias like Facebook, Instagram and Twitter also capture a fair amount of video viewers. With the amount of content available to social media users today, simply creating a stellar video is not enough. Content creators need to be able to reach your audience effectively. Adapting your YouTube videos for social media platforms like Facebook, Instagram, and Twitter can be a powerful way to repurpose content to maximize views and engagement. The issue is that while YouTube captures the attention of viewers for up to 9 minutes, other social media posts average about 9 seconds. This means that while on YouTube a viewer might give your video a good 30 seconds before deciding whether or not to continue watching, on other sites you only have a moment to capture their attention and are under time length limitations to tell your story. The simplest method for sharing your YouTube video across social media sites is to capture a still from the video and post it as a photo. You can then use the caption of your post as a means to link through to the full video. Another method, which proves to be more engaging, is to edit your long form YouTube video to fit a different social media app. Similar to how a trailer for a movie tells a snippet of a story that encourages people to watch to full thing. Some general tips adapting YouTube videos for social media include picking the most visually engaging aspect of your video, making the video as short as possible, and adding captions if the audio is necessary for understanding the video. Unlike YouTube where audio and music are really important, most other social media sites initially play videos without sound. While these are general rules of thumb, every social media site, industry, and brand is slightly different. If you are serious about maximizing engagement on social media and click throughs to another website such as the full video on YouTube, you need to be catering your strategy with these variables in mind. Knowing exactly how to condense or cut down a video and choosing creative choices for your social media sites is not an easy feat. Each brand and industry’s audiences are different and want different things in terms of social media videos. Additionally, each specific platform requires a different video content strategy. Deciding what aspects of a long form video should be kept and the ideal length of time for a video on varying social media platforms can be difficult. By analyzing creative content and feedback metrics, Artificial intelligence software such as Cortex can give strategy suggestions on creative features as well as optimal length of time that the condensed video should be.